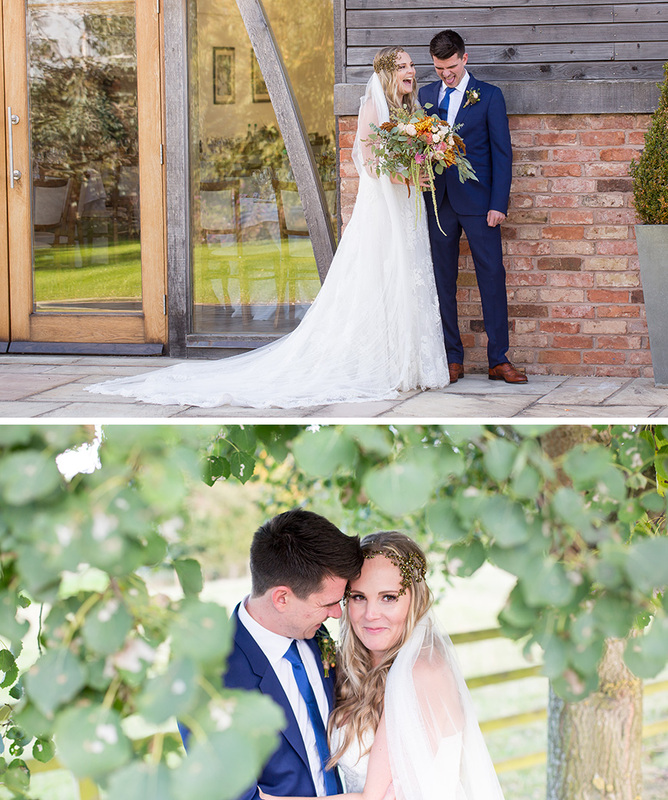 Finding their dream Leicestershire wedding venue, Rochelle and Joshua’s October celebration at Mythe Barn had all the ingredients of a fabulous day – effortless style, exquisite food, great entertainment and... romance. 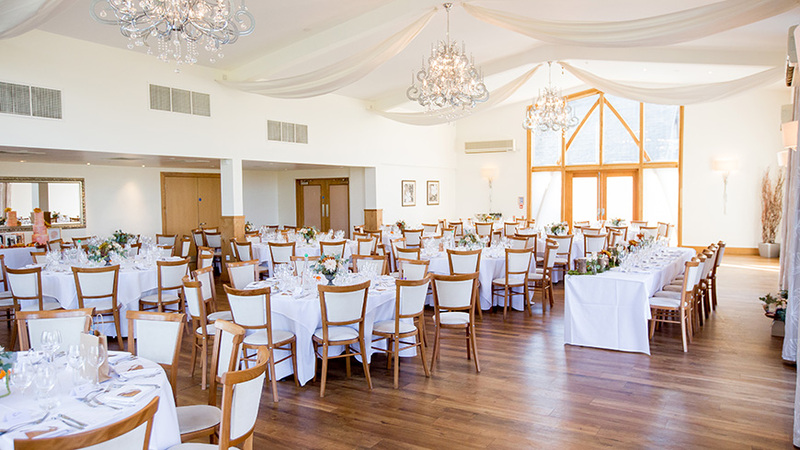 Setting an October date for their wedding, Rochelle and Joshua were looking for a barn wedding venue in Leicestershire, with a church nearby for their religious ceremony. 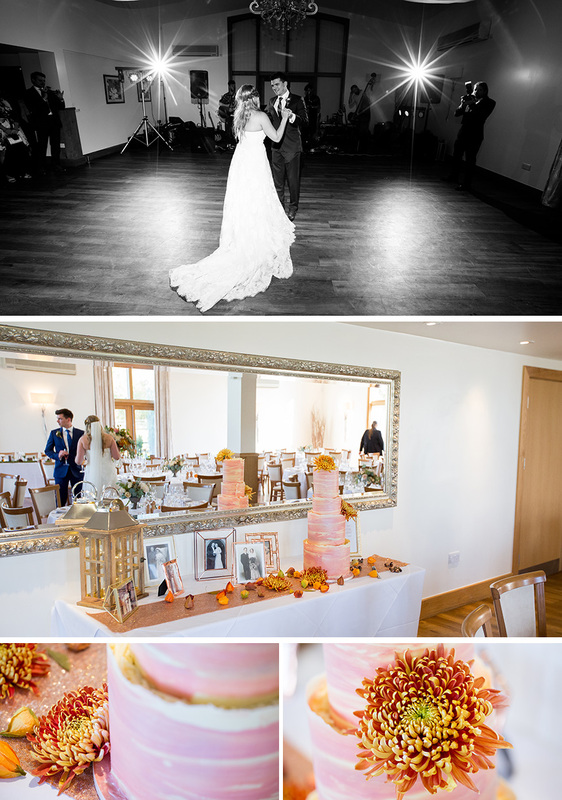 Mythe Barn proved to be the perfect place! 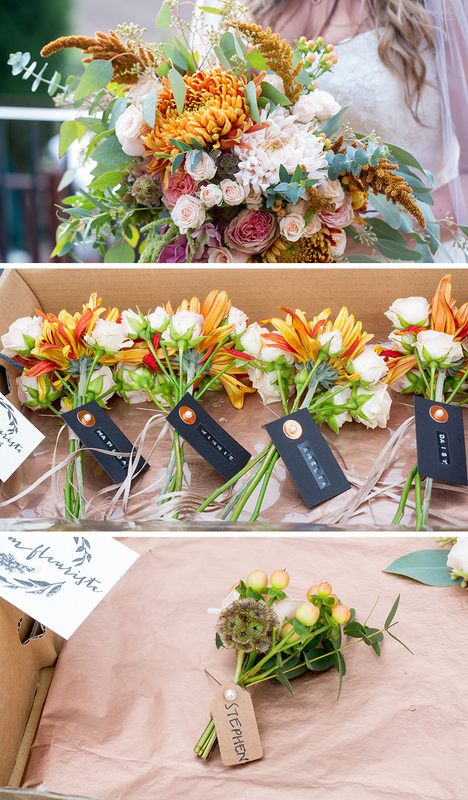 Marrying in the midst of autumn, the happy couple chose a relaxed, autumnal, bohemian theme for their day, adopting warm hues of gold with rustic tones. Floral centrepieces sat in urns surrounded by tea lights and gold leaf pumpkins. The top table featured a fabulous moss table runner, also adorned with tea lights. Pheasant feathers, foliage, autumnal leaves, lanterns and fairy lights were also used, adding to a wonderful, ethereal atmosphere. The beautiful bride wore a lace gown by Lusan Mandongus. She completed the look with family jewellery and a head piece and cathedral train by Hermione Harbutt. Meanwhile, Joshua looked the part in a petrol blue suit by Paul Smith. Finally, Rochelle’s seven bridesmaids were stunning in boho style gowns with a coral underlay and peony tulle netting. In keeping with the style of the day, Rochelle’s bouquet featured wild grasses, ferns, chrysanthemums, roses and peonies while the bridesmaids carried smaller versions with the same blooms. Following their romantic ceremony at St Michael and All Angel’s Church in Appleby Magna, the newlyweds and their guests enjoyed welcome drinks and canapés back at Mythe Barn. Moving in to The Grain Store to dine, a tartlet of lobster and king prawns was served to start, followed by beef two ways and, for pudding, a delicious trio of desserts. As day turned to evening, Rochelle and Joshua took to the dance floor for their first dance to ‘Songbird’ by Oasis. Live band, The Vintage Songsmiths, then delighted the happy couple and their guests and created a real party atmosphere. A fire pit barbecue was the perfect choice for evening dining on this autumnal evening. Of course, a wedding isn’t complete without a wedding cake. Rochelle and Joshua’s stunning white chocolate cake with coral marbling tasted as fabulous as it looked with four different flavours including passion fruit and lemon.